Photo Contributed by Cencio Boca/ Webster Athletics Senior track runner Jason Hickson runs in the Hanover Invitational on Sept. 6. Hickson went on to win the race and is only the third ever Webster student to win a race as an individual. This summer, senior cross country runner Jason Hickson took on the responsibility of true dedication. He worked three jobs and ran 80-85 miles a week. “That was one of the most stressful summers I’ve had in a long time,” Hickson said. His training proved successful when he placed first out of 61 players at the Hanover Invitational in Indiana Sept. 6. He was named St. Louis Intercollegiate Athletic Conference’s (SLIAC) Player of the Week. Hickson said he ran the “absurd amount of miles” in the summer by running at least 10 to 12 miles a day. That consisted of waking up at 6 a.m. sometimes to balance his running schedule with the three jobs he had over the summer — at Fazoli’s Italian Restaurant, Dollar General and as a lifeguard at Elks Lodge. Head Cross Country Coach Dan Graber acknowledged his improved fitness and the impact it has had this season. Graber said in the past, Hickson would attempt to stay in the front of the pack, but was unable to due to his fitness levels compared to other competitors. 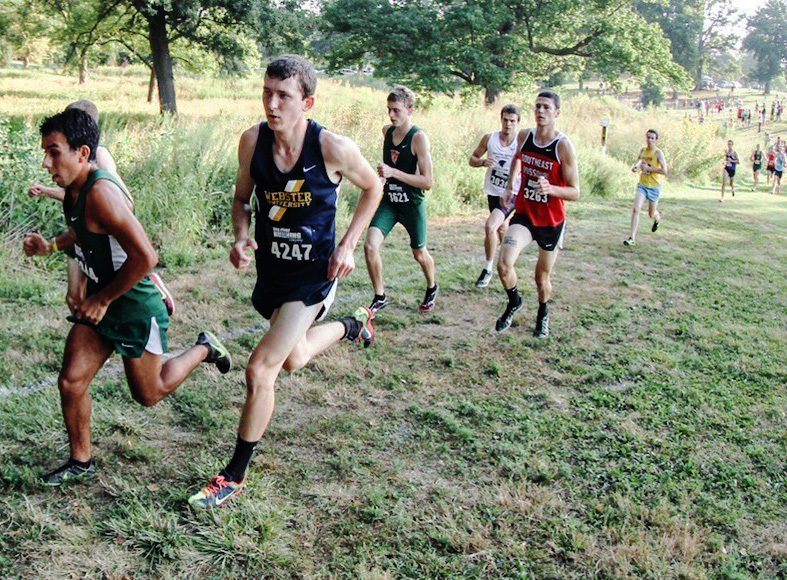 He is the third ever Webster student to win a race in the program’s history, which began in the fall of 2008. He insists he ran the 4.97-mile race, also known as an 8k, in 27 minutes and 27 seconds, although Webster Athletics posted it at 27 minutes and 28 seconds. He said that time was on the slower end of his races because of the hot and humid weather conditions in Hanover at the time. Hickson said that some of his toughest moments during his cross country seasons were the workouts and the pressures of doing well in them so he could compete successfully on race days. Former cross country coach Dusty Lopez recruited Hickson in 2011, but since Division III schools do not offer athletic scholarships, it pushed Hickson to focus on school more than in the past. That was a bit of a struggle since Hickson had to overcome a reading comprehension disability. He records some class lectures and uses the Academic Resource Center for help on school assignments and papers. Although he practiced alone during his off-season training — due to going back home to Hillsboro, Mo. — he came back to finish his season off with friend and teammate, senior Greg Fletcher. Fletcher and Hickson have been friends since their sophomore year when they met on the team. Fletcher said because they run the most on the team, they are almost always running together. “Cross-country and track are one of those brotherhood things where once you run it for a couple of seasons. It’s just massive respect for each other,” he said. Fletcher sees a successful outcome for Hickson in the upcoming races. He said Hickson was not as confident in his running skills in previous years, but his time and dedication helped him improve. Hickson came back on Sept. 19, at the Southern Illinois University in Carbondale (SIUC) meet, to beat his personal best in an 8k with a time of 26 minutes flat. He finished sixth out of 55 players, competing with and beating players from Division I schools like SIUC and Southeast Missouri State University. After Hickson competed in the Hanover Invitational the SIUC meet, he felt the work he put in during off-season training paid off and that gave him a confidence boost. Hickson also competes on the track team, but favors cross country more due to the change of scenery. He also prefers running outside to running on a treadmill — which he has nicknamed a “dreadmill”. Along with his accomplishments, including three SLIAC Player of the Week awards and beating his personal best times, he still wants to accomplish making First-Team All-Conference and try to win their conference meet. It will be co-hosted by Webster University and Fontbonne University and held Nov. 1 in Forest Park.